The Market Hall and Toll House (the smaller building to the right) are the two buildings shown in the photo above. We assume at one time the Market House was of the ‘classic town market’ design with an open area on the ground floor used on market days and an enclosed room on the upper floor used as a court house and for other official uses. Click on the thumbnail image on the right to see a sketch of what the building may have looked like. We were fortunate to be sent an image of a water colour painting by an unknown artist showing the old market hall and toll house in 1845. This was purchased by Amanda Ellard in 2016 from a collection of similar paintings by the same artist of scenes in and around Thornbury and other parts of the West Country. We are grateful to Amanda for allowing us to use the image on the website. Click on the thumbnail image on the left below to see the full painting. According to an English Heritage survey (available on the Internet) the ‘former market hall is listed as a probable mid-18th century remodelling of a 17th century building’. They also add that when the historian Caffall researched and wrote about the history of Thornbury he mentioned an agreement with a clockmaker in 1634 that a new clock should be set up within the town hall and came to the conclusion that there was a market hall on this site from at least the early 17th century. The Clock – a publication “The Early Clockmakers of Great Britain” (B Loomers 1981) tells us that Nicholas Jenkins made a Bristol Turret clock in 1610. The Town Trust records contain Caffall’s notes on a memorandum of 30th May 1634. “I Nicholas Jenkins of the Borough of Thornbury, clockmaker, have received the day and year within written the sum of five pounds … by the hand of William Jones of Thornbury aforesaid shoemaker.” The memorandum says that the money was collected from the free gift of Peter Hawksworth, John Jones (shoemaker), William Jones (shoemaker), John Bird, Phillip Harris, John Jones (mercer), Edward Thurston, John Thorne, William Jones the younger (mercer), John Clark, John Warner, Thomas Alpass, William Jones victualler etc. The money was for “a new good and sufficient clock well going” which would be set up within the Town Hall of Thornbury. Various records refer to the keeper of the clock. One such record says: ‘The keeper of the town clock when he resigned made a heroic effort: “I Nicholas Baker doe presente the Key of the cloke howse for I will kepe noe longer and I present you Mester Mayor and all the Rest of your Brerenne my sares to them all. Binge the 2 day of nember 1674 and soe I reste”. The workings of the clock are clearly visible from the staircase inside the shop. A note near the clock says that although it was designed as an eight day clock, it is necessary to wind the clock every five or six days due to the drop for the massive one cwt and half cwt weights being too short. The Market Hall – according to an article in the Western Daily Press of 18th March 1909 refers to Thornbury Market Hall. It says: “as far as the records went back such a market had existed since 1662. Certainly on 18th March 1670, King Charles the Second granted Viscount William Stafford and the Lady Mary the right to hold a weekly market for the buying and selling of corn and cattle as well as other things or merchandise. The Market was to be held on Wednesday and William and his heirs were to receive the tolls and profits. This right continued up until 1911 and with the right went the ownership of the Market House and Toll House and the responsibility to maintain those buildings”. There were several markets in Thornbury: a cattle market, a pig market, a corn market, a fish market and a cheese market are all mentioned in the records we have seen and we suspect that vegetables, fruit and other produce would have also been traded in the markets. The central market place was located in the area around the Market House, but we have no complete picture of where each market was located. The Corn Market is noted in several indentures as being in Silver Street in the 17th and 18th Century. The Pig Market was located on the road side between the Market House and Pye Corner (the area near the present 28 High Street). The Cheese Market was noted as being at the Railway Station in the late 1800s. Photographs indicate that the Cattle Market was held in the High Street extending to The Plain. A weighing machine and office for the market tolls was located just off The Plain in the wall opposite The Royal George from 1862 onwards. The running of the Market had not been a total success and it may have ceased operating from time to time. The 1791 Universal Directory for Thornbury says that ‘A very small market is held on Saturday; and three annual fairs, viz. Easter-Monday, the 15th of August, and the Monday before St. Thomas’s day’. Although in the 1830 Pigots Directory the market was said to be held every Saturday in addition to two annual fairs, the 1839 Robsons Directory refers only to three fairs held each year for the sale of cattle and pigs. There is an article in the newspaper of 23rd November 1839 suggesting a monthly market should be reinstated and talked of a petition to Henry Howard, the Lord of the Manor, about the remission of tolls. The 1842 Pigots Directory shows that the market had been re-established, now running monthly on a Wednesday.Henry Howard continue to own and to have responsibility for the market and the Market Hall which is why he was named on insurance related documents such as the receipt for the fire insurance premium shown here. Note that the building also serves as the Town Hall (see below). In the 1890s there had been increased concern about the position of the market held in the High Street once a month. In response to the criticisms of the market arrangements, Edward Stafford Howard, the Lord of the Manor said that he had made several attempts to find a new site and he was willing to sell his market rights to the District Council if they found somewhere suitable. A meeting was held in 1899 to consider the options and to put forward the case for extending the cost of establishing a new site on the ratepayers of the neighbouring parishes, not just those of Thornbury. The District Council refused to consider the option although they were in favour of extending it to the ratepayers within the Thornbury Special Drainage District. The main concern was the lack of cattle stalls which allowed the cattle to roam freely around the High Street. 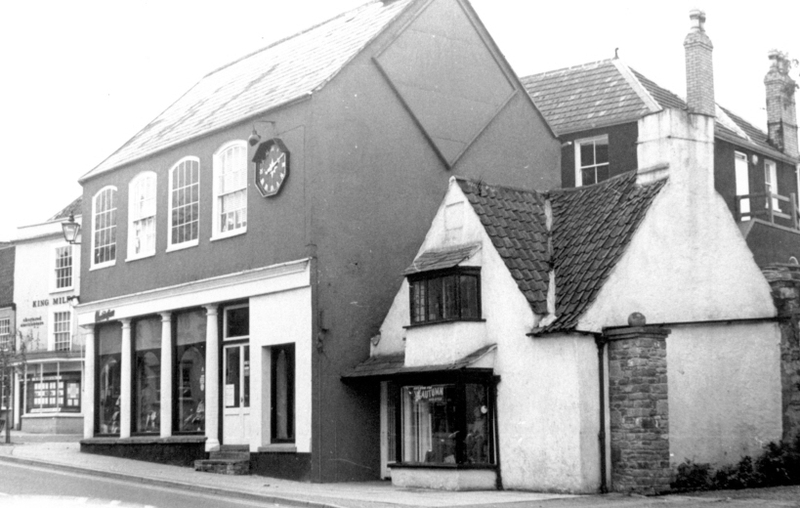 The pig market which had been held between the Market House and the Post Office (then located in Pye Corner at 28 High Street) was closed because it did not meet the new regulations that a paved area was required. The Council refused to consider taking on the cost of paving. On 13th September 1899 two of the councillors suggested asphalting the area but the chairman, Stafford Howard, was against this and it was suggested that the owners of the properties in that area might object. A temporary arrangement was to be made utilising the garden adjoining Bartletts the butchers at 4 The Plain. It was suggested that a cottage would be pulled down to improve ingress and egress for the pigs. (We are not sure which cottage this was unless it was property in St Mary Street we have called the Birt House which wasn’t pulled down in the 1920’s). The search for a new market site went on. During the next ten years various alternative sites were considered, including Ogborn’s field adjoining 8 High Street, a plot in Gloucester Road opposite the entrance to Shen, two sites near the Railway Station and a site where the Rock Street car park now stands. The Western Daily Press of October 5th 1908 made it clear that the Board of Agriculture had threatened to close the cattle market which was said to have been held in the open streets ‘since time immemorial’. The same article said that Mr E Stafford Howard as Lord of the Manor had written to the District Council as owner of the market rights he was willing to give all assistance possible. The clerk of the Council expressed the opinion that it would cost about £2000 to complete this scheme and said it would have to be met by the parish of Thornbury. A further article in the Western Daily Press of 18th March 1909 showed that the market was now only taking place monthly on the second Wednesday in the month. The rights to the market were leased to Luce Young and Luce for £5.00 per annum. The Western Daily Press of November 15th 1909 reported with regard to the Rock Street site that the lady who owned part of the land on which the new market was to be built could sell her property for £250, providing she had two months’ notice for her tenants. Mr Gayner who owned the other part could sell for £150. The market rights could be bought for £150. The Western Daily Press of Monday 27th June 1910 reported that the Rock Street site could not no longer be considered. The site finally chosen was off Bath Road with access from Upper Bath Road. On January 11th 1911 Francis Yates sold the necessary land to Thornbury District Council for £950 and the new market could begin. We are not sure when the last market was held in the High Street, certainly there was a Christmas market in December 1910 which was presumably in the High Street, although we have been told that the last of these markets took place in 1911. The Citizen of Thursday June 15th 1911 announced that the new market in Thornbury had opened on Wednesday, which we assume to be June 14th 1911. The total cost of the new site, including purchase of market rights etc, was £2,894 and the equipment cost £4,800. This was to be paid for by a farthing on the rates. Great optimism was expressed about the future of the market which according to the Gloucester Journal was now to be held fortnightly. The Town Hall – according to the English Heritage survey ‘In the 19th century the market hall doubled as a town hall, and is marked on the 1840 Tithe map as the ‘Town Hall’ and on the 1880 Ordnance Survey map as the ‘Market House’. It was formerly known as the Moot House (Gloucestershire Record Office place name index). The precise role of the hall in the 19th century is not known‘. Other sources including Caffalls notes, and Edmund Lloyd’s recollections of the Thornbury mention that the Town Hall was called The Booth Hall. There were several Booth Halls or Boothalls around the Country, including one in Gloucester, which were all closely associated with the town market and the court. The origin of these places was apparently originally connected with the sale of leather and the upstairs room above the market became the location of the court and assizes. This seems the likely arrangement in Thornbury where the building appears to have been a classic open marketplace with enclosed meeting room above. Documents copied at Stafford Records Office include one which refers to the shop under the stairs leading up to the ‘Buttall’. The Court of the Honour of Gloucester which dealt with cases relating to the recovery of debts over 40 shillings. The Hundred Court held every three weeks before the Steward of the Manor and two free suitors for the recovery of debts under 40 shillings within the hundred. The Borough Court held every three weeks before the Steward of the Manor dealing with cases of debt under 40 shillings arising within the borough. These meetings involved the Mayor and the twelve Aldermen, collectively known as The Corporation. In the 1800s they meetings were transferred to the Swan. The Mayor managed a number of houses and lands gifted to the Corporation and arranged the letting of that property. He was also responsible for the distribution of bread and clothing to the poor people of the area from the income derived from ‘rent charges’ levied on several properties in the town and for maintaining proper accounts of income received from the charities and expenses incurred. The Manor Court or Court Baron, held occasionally before the Steward of the Manor and tenants, where besides ordinary business, tenants are admitted to their copyholds. We have transcriptions of some of Caffalls notes on the ‘Court Leet and View of Frankpledge’ meetings in Thornbury held about twice a year at the Booth Hall in the 18th Century. According to Wiki, ‘the duty of the court leet was to view the pledges, which were the freemen’s oaths of peacekeeping and good practice in trade, and also to try by jury, and punish, all committed within the jurisdiction. It also developed as a means of proactively ensuring that standards in such matters as sales of food and drink, and agriculture, were adhered to‘. Court Leets generally had a jury formed from the freehold tenants, as bondsmen could not give an oath. The jury’s role included electing the officers (other than the Steward who was appointed by the lord), bringing matters to the attention of the court and deciding on them. Attendance at the Court Leet was often compulsory for those under its jurisdiction and the Court levied a fine for non-attendance. The Officers appointed by the Courts Leet in Thornbury included the Mayor, two Constables to ensure law and order in the borough, two Ale tasters to ensure the quality of ale, and to check that true measure were used, two Carnals to ensure the freshness of meat and poultry, Affeerers, responsible for assessing the level of fines, Sergeant of the Mace to carry the Mayor’s mace on ceremonial occasions. Further appointments of reeves, beadles, tithingmen, ditchreeves, and haywards were made to administer life in the tithing of Thornbury. During the 1800’s the various court meeting were transferred away from the Booth Hall. The 1852 Slaters Directory shows that the new County Court for the recovery of debts not exceeding £20 was held monthly at the Market House, but by 1868 these meetings were held at The Swan. The Court Leet meetings were also held at the Swan Inn and gradually their responsibilities were taken over by the Board of Guardians for the Poor and later the Parish Councils. The Court Leet continued to be held once a year but the appointments and meetings became largely ceremonial and appear to a good excuse for the town’s men to have a jolly good time. They were finally abandoned in the early 20th Century. 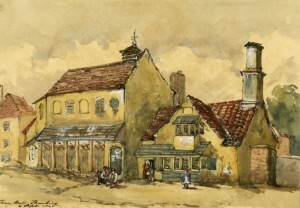 An abstract of title relating to the Market House in 1902 shows that the building was shared between the Parish Council and Ernest Percy Weatherhead who was running an adjoining shop. On the 12th July 1900 the Weston Daily Press reported that Stafford Howard had offered the use of part of the former Market Hall building for the storage of the fire engine and apparatus. We know from photographs, such as the one on the left, that the Council was using part of the building on the ground floor as a ‘Fire Station’. The Gaol – the English Heritage Survey said: ‘A gaol or lockup was located in the market hall and still survives today under the stairs. Access to it can be gained by passing through two doors. The inner door is made of thick planks with strap hinges and an open window with iron bars. The outer door is made of studded planks with strap hinges. The 17th century date for the building is the earliest possible date for the gaol; however, it is likely that it was built when the building was remodelled in the mid-18th century‘. We know from an account written by Edmund Lloyd in the late 1840’s or early 1850’s that the town prison was called ‘The Blind House’. Further investigation by Meg Wise of Thornbury Museum found that ‘small gaols or lock ups were known as Blind Houses because they had no windows. Most of the ones that remain date to the 18th century. The lock up was usually a small stone building with a heavy wooden door and ventilation provided by a grill or grills often positioned above head height. Inside there would be a wooden bench, an earth closet in one corner and an iron ring embedded in the wall so that violent prisoners could be chained up. Some Blind Houses were however placed inside old Market Halls and Town Halls and this seems to be the case in Thornbury where the old gaol still exists (now used as a storeroom) in Wildings shop which was formerly the Market Hall. The prisoners were locked up (usually overnight then were released, taken to the local court or moved to larger prisons in bigger towns) for crimes such as drunkenness, burglary, picking pockets, stealing livestock and poaching’. Market Toll House – the Images of England website describes the Toll house as being ‘Early C17. Rendered. Pantile roof. One storey and attic in steep gable. One bay window modern on ground floor, 1-3-1-light casement with moulded mullions above. Modern door to side’. We are not sure how the toll house operated nor when it ceased to be used. We assume that cattle and other traders were charged a fixed rate for each animal brought to market to be sold and that the income was given to the Lord of the Manor. We know that from the 1840’s onwards the Toll House was occupied by families (see below) and that they are listed in the census as having occupations other than toll collector. It is possible that they combined two or more occupations as the collection of market tolls was only a part time occupation. For the reasons referred to above, the early uses of the Market House and the Toll House had diminished by the mid 1800’s. At the time of the 1840 Tithe Survey the Toll House was already being let to Joseph Prewett who traded as a stationer and newsagent there. Nurse Higgs – the 1911 census shows the building was occupied by Mabel Eunice Higgs, a nurse midwife aged 30. She was unmarried and had been born in Gloucester. The census records the house as having two rooms.